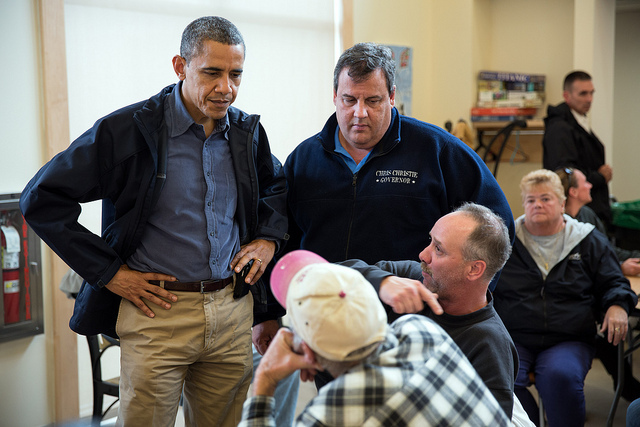 There have been a lot of reports on how Republican Governor Chris Christie has been very appreciative of President Obama during the Sandy aftermath, after Christie had previously slammed Obama about his lack of leadership. A Republican praising a Democrat running for re-election? Oh, the horror. I just don’t get it. Are people so partisan that they would rather have an ineffectual head of the US during what is definitely the biggest disaster in recent years [cue President Bush and Katrina] versus a President that is actually trying to help the people he represents? And also have a governor that both asks and accepts help from same leader? Last time I checked, that was their job that they were elected to do. Sure, Congress is elected and manages to get nothing done for those they represent, but in what world is that the correct way things are supposed to be? Now Christie can be as partisan as they come, but the man does speak his mind, and I am sure that he is damn well going to get some things done, and quick. While I do not agree with many of his politics, I do respect Governor Christie in his actual actions as of late. To paraphrase him, ‘I don’t give a damn about the election’, and Obama has more or less stated ‘the election will take care of itself ‘. Now is this a possible boon for the President and can he afford to be magnanimous right now considering the political points he can make by portraying the responsible leader? Of course, but to be that cynical to think that is the reason for his actions is just a bit too much to accept. Besides, Christie may not get many brownie points from the Republican elite for his words this close to an election, but obviously he does not really care about that right now. Both men are more concerned with getting help and aid to people as soon as possible, period. That is what are government leaders are supposed to do, lead. To make a big deal of the politics at this time is petty and down right inappropriate considering what our citizens are going through right now. I feel we have lost out way in this country, and are focused on the little unimportant things and ignoring the larger issues that really affect us at this time. Everyone needs to take a breath and step back a few feet to think about what is really important, and keep the political stances in perspective.